Report on the Spring Meeting in Utrecht on March 20th, 2016. 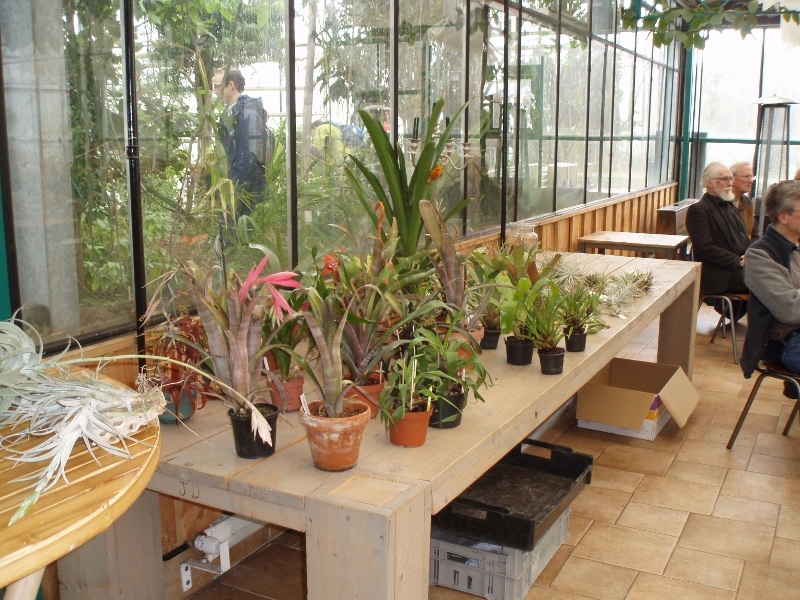 On this spring day, 29 Bromeliad-lovers (22 members and 7 guests) met together around 10 a.m in the Conservatory of the Botanical Garden in Utrecht. Until 11 o'clock we enjoyed coffee, admired and discussed plants that had been brought along and exchanged experiences. At 11 o'clock Eric Gouda, as chairman, opened the house-keeping meeting. Piet van Beest, the treasurer, and Roel Tomassen, the secretary, were also present on behalf of the Board. The chairman described the day to come: firstly, a house-keeping meeting, then a discussion of the plants that had been brought along and the midday lunch and plant auction. In the afternoon he would take us along on his trip through Ecuador. The report on the Autumn Meeting on October 11th 2015, sent with Newsletter 82, was approved. There were no comments or questions about the Financial Report as included in Newsletter 83. The Audit committee, comprising Hans Willems and Ed Gerritse, had approved the financial administration for 2015. The Audit committee for 2016 will consist of Ed Gerritse and Gerard van Heusden. The explanation relating to some amendments to the (re-)election order of Board members that was sent to the members with Newsletter 83 did not lead to any further questions and the changes were agreed on. Thus the current chairman and treasurer were re-elected until 2018 and 2019, respectively. The appointment of the current secretary will expire in 2017. The next point concerned promoting the Bromelia Contact Group. In due course, the chairman and the secretary will try to put together an information leaflet about growing bromeliads and about the role of the contact group. The info leaflets recently put out by the Dutch Orchid Society (NOV - Nederlandse Orchideeënvereniging) can serve as an example. The Orchid Society North-Holland North (Orchideeënvereniging Noord-Holland Noord) in Wijdenes has existed for fifty years and wants to mark this jubilee by organizing an exhibition together with Intratuin in Heerhugowaard to be held from October 28th to 30th, 2016. The secretary of the BCG, himself a member of this Orchid Society, has heard from the organizers that the BCG could join in with an information/advice stand. Members present were positive about this initiative and the following offered, in principle, to man the info-stand: Ina en Ed Brinkkemper, Piet van Beest, Hans Willems en Gerard van Heusden. Roel Tomassen will not be able to take part in the exhibition but will continue as contact person until October. The firm of Corn. Bak, Bromeliads will support the exhibition by supplying display plants. The chairman remarked that the information material discussed earlier will need to be ready by then. With regard to the planned 2016 excursion to Blijdorp Zoo, it was agreed to put off the visit until 2017. Various things would need to be discussed beforehand in connection with the rather complicated opportunities for visiting the bromeliad collection. Peter Bak, director of the firm Corn. Bak in Assendelft, said that he was willing to welcome the BCG for a visit to the Bromeliad nursery on Sunday October 9th 2016. The Autumn Meeting could then take place in the cafeteria of the nursery. The members will get a further communication about this. There will be no lottery of plants brought by members as bringing such plants into the nursery is not allowed! This point will also be included in the announcement. This was followed by a short debate about the management of plant collections, whereby Albert Ebbink referred to the current situation in England. Private individuals and hobbyists there can, with their collections, form part of the National Plant Collections. On the BBC2 Gardeners World site they show and tell how they grow their beloved plants. There is something similar in our country but not for private individuals. The Stichting Nationale Plantencollectie or S.N.P. (set up in 1988) manages taxonomically-verified living plants, mostly growing in Botanical Gardens; the Nederlandse Vereniging van Botanische Tuinen (N.V.B.T. - Dutch Foundation of Botanical Gardens) set up ten years later, in 1998, has since taken over several tasks from the S.N.P. [Translators note: the British National Plant Collections are under the care of the NCCPG at Plant Heritage http://www.nccpg.com/National-Collections.aspx which has details of collections and resources. The NCCPG appears to include some features of both the S.N.P. and N.V.B.T. 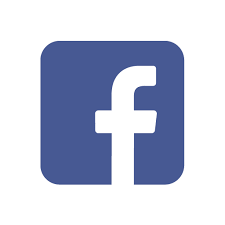 and of the N.P.C., a Dutch organization for cultivated plant collections which does include private collections]. One can support botanical gardens and the like financially and/or physically, as volunteer, donor or friend etc. The Tillandsia Collection (Schutzsammlung) of the German Bromeliad Society (DBG - Deutsche Bromelien Gesellschaft), derived from donations from private collections, is entirely cared for by volunteer, members of the DBG, financially supported by the Society and by donations. Without these initiatives, these often very valuable collections would be lost or at best be broken up by becoming distributed over (many) different hobbyists. There was a roll of surplus screen mesh from the firm Corn. Bak available for anyone interested. 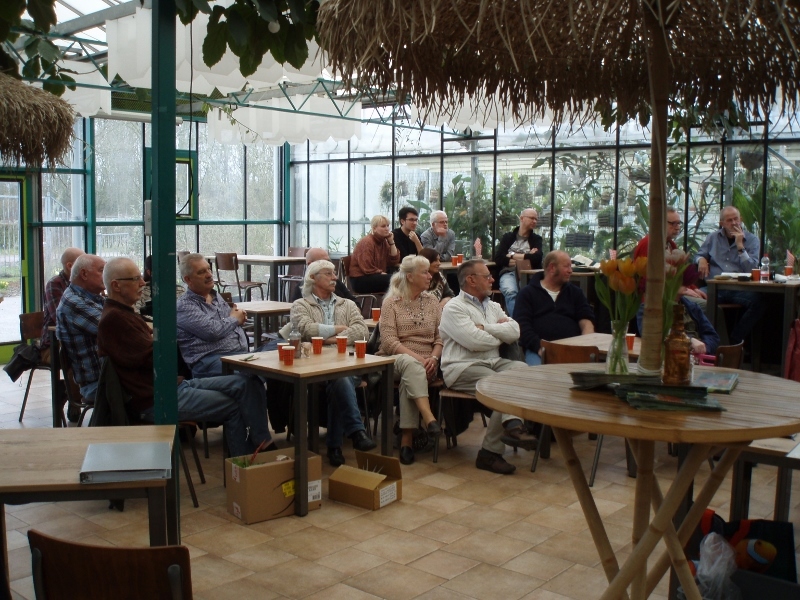 Ed Gerritse said that the Orchideeënvereniging Kring Utrecht (Orchid Society, Utrecht section) was organizing an excursion on June 18th. There were still a few places free in the bus for non-member enthusiasts. Price € 22, information from mevr. J.P.M.Nagtegaal, tel. 030-2970431. The trip will visit Anco-Orchids in Wateringen, a Cattleya-nursery in Pijnacker and Cymbiums in Nootdorp. This ended the meeting but not before the secretary, on behalf of all those present, had thanked Eric and Renate Gouda for all the work they put into organizing these meetings in Spring and Autumn each year. It was with great pleasure that they were both given a tasty token of appreciation. After this, the plants that members had brought were reviewed along with some plants from the Botanical Garden. Gerard van Heusden showed a long artificial branch (fig. 4) that he had brought and which had various flowering Billbergia nutans tied to it. In the summer the branch hangs outdoors on a tree, in winter it is brought indoors and regularly sprayed. Hans Willems showed a similar artificial branch with Tillandsia seedlings. He had also brought a flowering Vriesea chrysostachys (fig. 6), a small form. 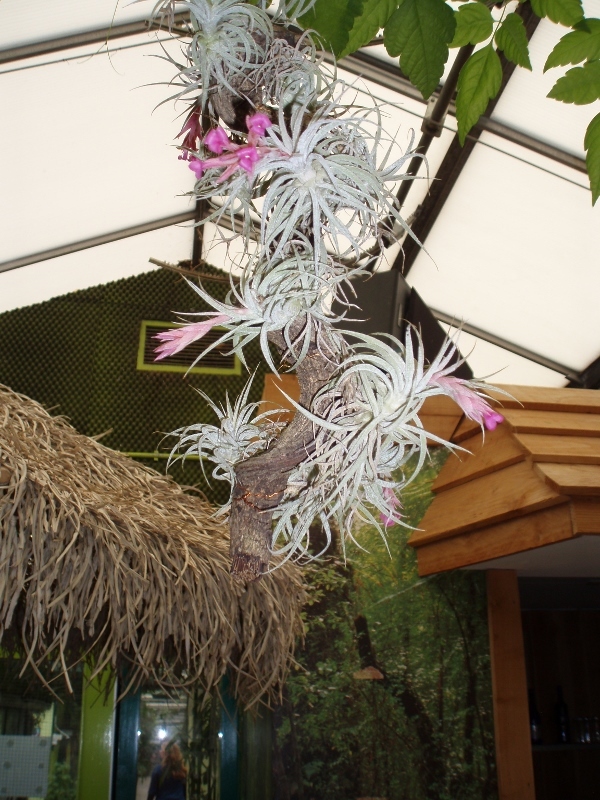 Eric Gouda showed a branch from his collection with several flowering plants of Tillandsia sucrei. 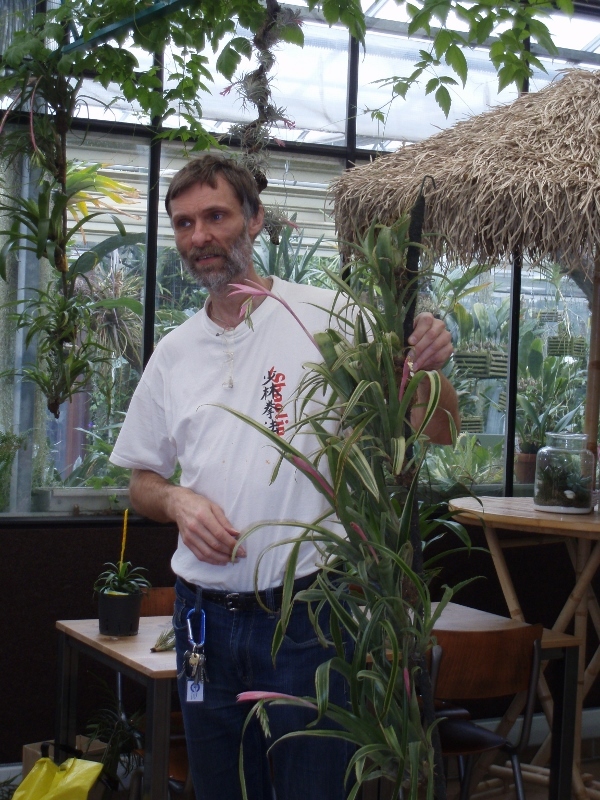 Roel Tomassen had brought a flowering Aechmea carvalhoi, bought some years ago from Michael's Bromeliads in the U.S.A. He further showed a flowering Fosterella spectabilis, a Tillandsia foliosa and a Tillandsia achyrostachys. This last variety seemed up till then to be hard to get hold of but Eric was able, just before the meeting, to cross-pollinate this plant with one flowering at the time in the Botanical Garden's collection. 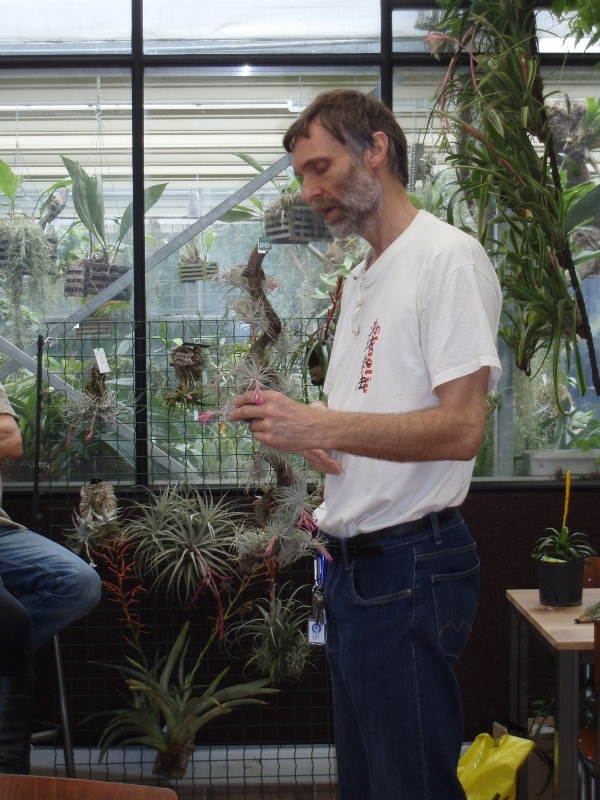 Eric then discussed various flowering Tillandsia species from the Botanical Garden's collection: seleriana (acquired at the time from the collection of the late Jürgen Lautner), zecheri, recurvifolia, arequitae, andreata, schusteri (from Mexico) and Racinaea tomaselllii. Tillandsia heterophylla was brought by Piet van Beest. 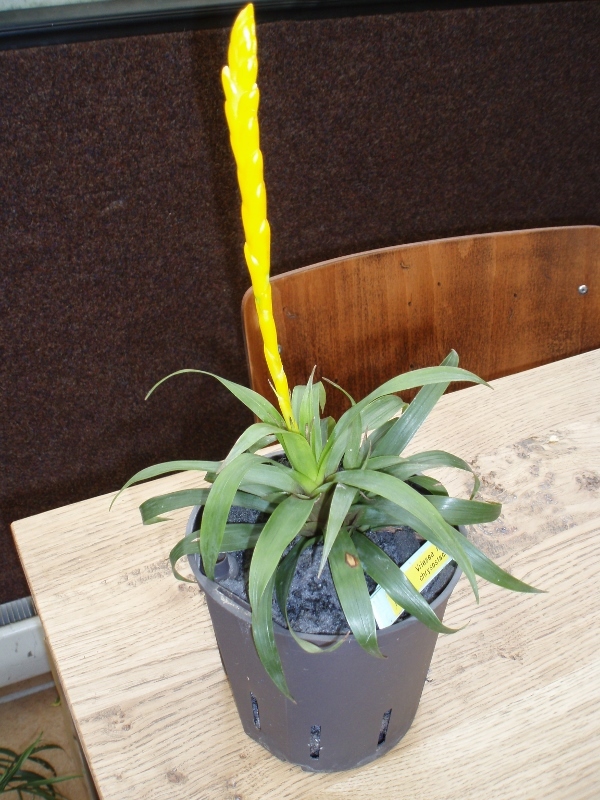 Finally, Eric showed and described three flowering plants intended for the auction: Billbergia 'Gouda`s Glory', Canistrum montanum and Aechmea lindenii. During lunch there was an auction of the many plants that had been brought both by members, by the Botanical Garden and by the firms Corn. Bak and Westerman. The to and fro bidding over some much desired plants led to some lively moments. The profit from this auction will be a great help to our contact group and the chairman thanked the donors very much for their contributions. To end this day, our chairman took us on a journey through Ecuador. We viewed many, many images of bromeliads in their natural habitats. Sadly, as the clock struck four this trip came to its close with the image of “The End” bringing enthusiastic applause for Eric. Then we said goodbye and everyone was wished a safe journey home.